Phlebotomy is the practice of drawing blood for analysis, donation or medical testing. Phlebotomy technicians work directly with patients to collect blood samples, bio-fluids, and maintain proper handling of these materials. 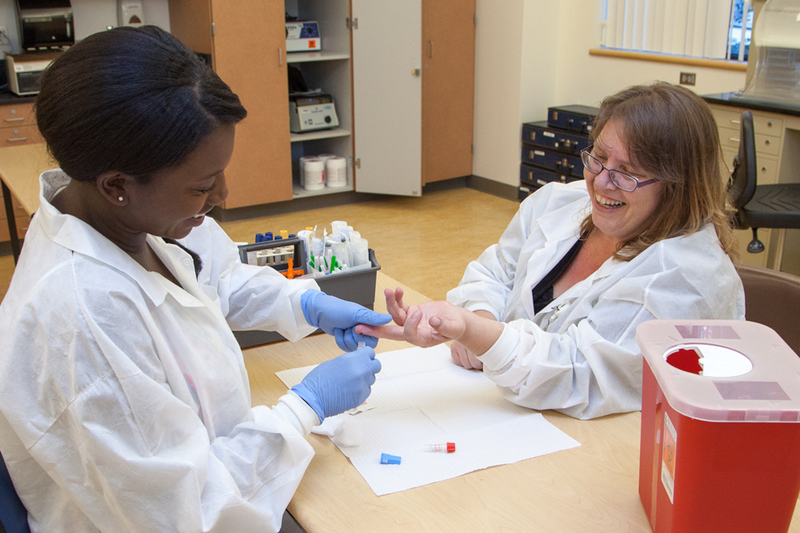 Students in Clark's Phlebotomy program learn to perform a variety of blood collection methods with hands-on training from experienced faculty. Clark's phlebotomy coursework includes theories and principles related to obtaining blood specimens from many different kinds of patients, including adults, children and infants. The Phlebotomy curriculum prepares students to perform skin and venipuncture and function as a member of a medical laboratory team. The program includes and emphasis on safety, patient identification, quality assurance and specimen handling. The program curriculum includes a one-quarter lab practicum, providing students with hands-on training practice in a health care facility. Employment opportunities for Phlebotomists exist in a variety of medical environments. The U.S. Department of Labor and Statistics show Phlebotomist jobs growing at a rate of 14%, with a median wage in the Portland-Vancouver metro area estimated at $18.56 per hour.